When we discuss types of bullying, they can include both the place that the bullying occurs and the actual form the bullying takes. What they all have in common is that they are usually directed at a specific target with the underlying goal of making that target feel humiliated, powerless and helpless. All bullying can have a devastating effect on the victim, resulting in everything from anxiety to eating disorders to depression and even suicidal tendencies. Bullying is most often associated with the school environment and unfortunately it is still quite prevalent there, from elementary school through college. School bullying can take many forms, from physical abuse to emotional abuse. Younger students will usually exhibit more direct forms of bullying such as one student beating up another in the schoolyard while older students are more likely to engage in spreading rumors or even using undue pressure to gain sexual favors. Of course, any talk about the types of bullying cannot end at the schoolyard. 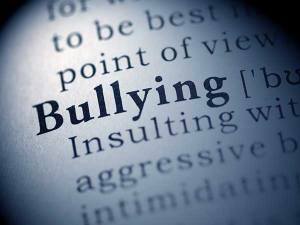 Surprisingly, bullying can carry on into our adult life, with workplace bullying, road rage, and even bullying among neighbors all being extremely common. Basically, any time or place where one person can exert a sense of control over another is open to the possibility of bullying. It is almost impossible to avoid and most people will probably admit to having been bullied at least once in their life. What makes bullying so difficult to counter is that it can take so many different forms. Physical attacks are only a small percentage of bullying instances. Far more common is emotional bullying, where the bully uses verbal threats and intimidation to get what they want out of their victim. This can include spreading false rumors, taking credit for the victim's work, or simply using derogatory language to belittle the victim. One of the most insidious types of bullying in this day and age, and one that spans every level of society from school to work to home, is cyberbullying. With the advent of the Internet, bullies suddenly found themselves with a whole new arsenal at their disposal, one which not only allows them to have a larger audience for their bullying but also makes it easier for them to hide behind false identities. Bullying online can take the form of posting hurtful or abusive texts, posts, images or videos; deliberately ignoring others within a group; spreading nasty gossip or imitating the victim's own posts or even using their online identity. This can be the hardest type of bullying to stop as it can be almost impossible to prove or to identify the bully. No matter which of these types of bullying you are dealing with, the effects can be terrible to witness, either as a victim yourself or the friend or family member of a victim. Children bullied in school may be so traumatized that they drop out. Employees bullied in the workplace can have their work affected to a point where they end up losing their job. Bullying in your neighborhood or online can make everyday life excruciating. The important thing for everyone to remember is that bullying wears many faces and all of them are ugly and brutal. If you or someone you love is being bullied, don't hesitate to reach out and get help. There is no reason that anyone should have to live with this kind of pain.